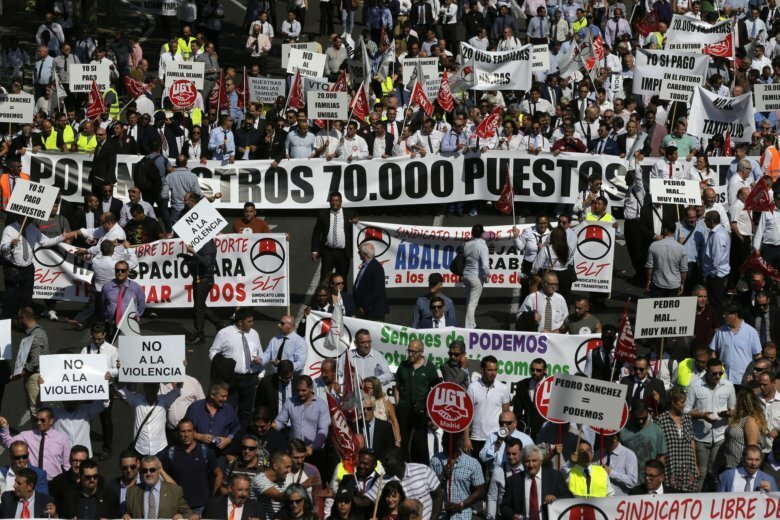 MADRID (AP) — Hundreds of Uber and other drivers are blocking a central artery in Madrid to protest the Spanish government’s plan to approve new rules limiting the operations of app-based ride-hailing services. The drivers, who work for companies including Uber and Cabify, brought traffic in the capital’s Paseo de la Castellana to a standstill Thursday as they moved slowly toward the entrance to the Development Ministry. They plan to repeat their protest on Friday, when the government is expected to pass a decree giving local governments the power to limit licenses for the ride-hailing services. On Wednesday, the companies offered free rides in several Spanish cities. The move furthered angered taxi driver unions, which have been demanding a ratio of one ride-hailing car to 30 public taxis.